Club Regalia For Sale: Contact: Keith and Margaret Watson (these will be available at Club Nights) EBOP Cloth Jacket Badges $7.50 EBOP Cloth Jacket Patches $10.00 EBOP Car Window Stickers $1.00 EBOP Car Bumper Badges $20.00 EBOP Lapel Badges $6.00 EBOP VCC Windscreen Stickers $2.00 EBOP Cloth Caps $15.00 Rally Number Holders s/s $15.00 NZVCC Winged Lapel Badges $7.50 VCC Cloth Winged Badges $13.00 EBOP Name Badges $15.00 (to be ordered) Please wear your name badge to VCC functions. Club Captain Report Classic Car Breakfast. Our usual crowd was there enjoying the food and company and admiring the cars. Bruce Taylor His funeral on Friday 8th was well attended by our members and Les Coster gave a good summary of his involvement in and contribution to our club. He will be missed. Bruce was also deeply involved in the local Fire Brigade for I think 32 years including several years as Chairman. As well he helped out at the Men's Shed. In these and other activities he was very well supported by Maureen. North Island Club Captain's Tour (NICC) We in our 1973 MGB Roadster joined this Tour in Taupo along with Harry and Gay in their 1961 Wolsley 6/99. Local Club Captains organised the tour when it was in their area. Just before the start of the tour Kaaren Smylie, the NI Club Captain, ended up in hospital with an eye complaint so could not lead us which was disappointing. John Foote was asked to take over and did an excellent job. At Taupo the Taupo Country Roads Rally was included in the tour. 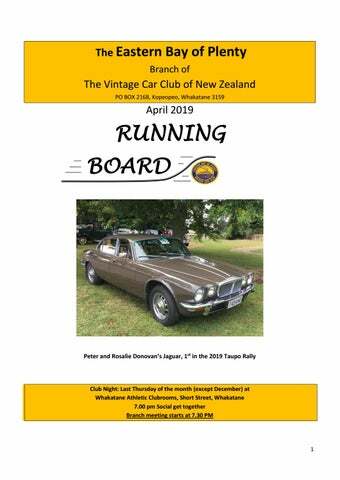 Other members of our club in this rally were Peter and Rosalie Donovan in their 1974 Daimler and Harry and Gay Sutcliffe who were passengers in Brian and Viv Guest's 1952 Desoto Diplomat. Brian and Viv are from Warkworth and Harry and Gay knew them from their time in the Wellsford-Warkworth VCC. There were two sections in the morning part of the rally and at the start and end of each section there was a question to answer. These were: what is the car on the front cover of the latest Beaded Wheels; which is the biggest tyre manufacturer in the world; how many roundabouts did you go through on Kinloch Road; and what are the colours on a Bunnings sign. (Answers: Bugatti, Bridgestone, three, and red, green and white). After lunch at the Mokai school we had a tour route back to Taupo. It was a good rally with good scenic roads, and good weather. The car harry and Gay were in came 3rd in its class and Peter and Rosalie won their class and also came first overall. A great effort on their part. The next day the NICC tour went to Napier and took 120miles to get there going via Tutira. Half way to Napier soon after the big 'banana' shaped bridge over the Mohaka River is an un-named side road on the left which with a few hundred turns ends up at Tutira. The road was gravel and corrugated and winding and as it was drizzling the cars got very muddy. The local school at Tutira put on lunch for us. After lunch we took a right turn just south of Tutira and this gravel road went into the hills and along the tops of ridges. The weather had cleared a bit so there were fabulous views. This road came out in Esk Valley. The next day the tour took us to Waipukurau, 42 miles away on SH2, but it took us about 90 miles to get there. Lunch stop was at Kairakau Beach. The local Club captain also found plenty of gravel roads for us and the weather was fine. From Waipukurau the tour took us to Palmerton North, 70 miles on SH2, but it took us 125 miles, via a lunch stop at Totara College in Dannevirke. Again this morning there were plenty of good gravel roads. In the afternoon there was a stop at the Tui Brewery in Maungatainoka then on to Pahiatua and then ending up at Manawatu Clubrooms. Once again the weather was kind to us. The final section was Palmerston North to Wanganui via Marton and here we had a very pleasant picnic lunch in the Museum grounds. Today the roads were all sealed. There were a few showers in the morning but they soon cleared. It was then onto Wanganui where the tour ended after the Final Dinner at the Wanganui VCC clubrooms. Bruce Taylor On Sunday 3rd March Bruce passed away at Golden Pond Rest Home after a short stay. As an apprentice motor mechanic in the early 1960’s I remember Bruce at E R Dillicar Motors, the Standard and Triumph agent. He was the man to see if you had a query on any of these makes. He was a very patient and knowledgeable man after spending his working life in the motor trade. Bruce joined the Vintage Car Club on January 30th 1987 so that he could go Motorcycle Rallying with John Shapley. Bruce had had two or three English Motorbikes, but when Maureen bought him a basket case BMW 250 he was smitten and BMW became his favourite machine. He restored, rode and rallied BMW’s for many years. Bruce also restored a beautiful green Triumph Spitfire which was a credit to his workmanship and attention to detail as was the many BMW Motorbikes he restored. Bruce and Maureen travelled many miles in their Spitfire attending many Club Runs, Rallies and Events. Sadly, Bruce’s health declined but he was able to finish his last BMW restoration, but never rode the beautiful red machine. On 12th August 2018 Bruce was presented with his 25 year badge. Bruce will be missed by all of his friends and Club Members as he was a quiet unassuming Member and an inspiration to us all. Our condolences go to Maureen and her family. All positions are up for nomination and if you would like to make a difference to the running of your Branch, please come along and either nominate a Member you wish to have on Committee, or maybe be part of the Committee yourself. Remember this is your Branch of the Vintage Car Club and your input is vital to the running of our Club. 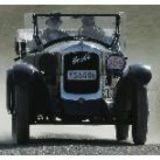 The Vintage Car Club of NZ, Eastern Bay of Plenty Branch (Inc). Photo supplied by Joy Growdon â&#x20AC;&#x201C; Napier Art Deco, morning tea before the Parade. Peter & Rosalie 1st overall. And finally, some yummy cars at the March Classic Car Breakfast, photos taken by Barry. Club Run.. Meet at the Riverslea car park in Edgecumbe at 1.15pm. From there we visit the Manawahe Eco Trust. Afternoon tea supplied but bring your food. EBOP VCC AGM. At the Athletic Club Rooms in Short Street. Meet from 7.00pm and the AGM meeting starts at 7.30pm. Waikato Mooloo Meander Model A Rally Te Anau South Island National Easter Rally at Ashburton Taranaki Maunga Moana. If interested our secretary Karen can email you the entry form.